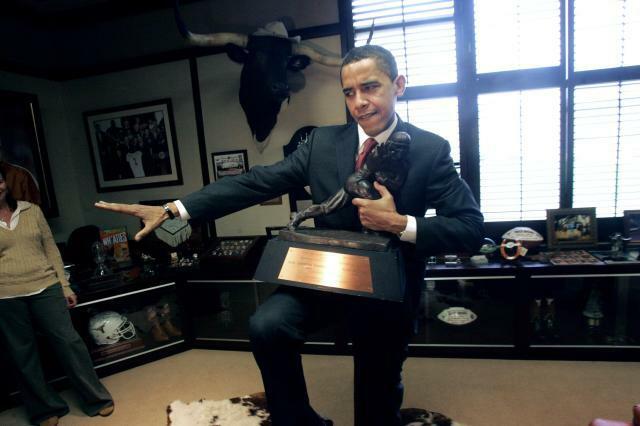 There are people in this country who have a clear idea of what the Heisman Trophy is. They hear someone say Heisman and an image of the bronze football player in the leather helmet, one arm cradling the football, the other defending an oncoming attack, pops into their head. I would say, for some, this representation is as ingrained as Mickey Mouse, Jesus Christ, Betty Boop, Elvis Presley, Picasso, Marilyn Monroe, and/or Albert Einstein. These associations, no matter how lofty, are justified, the Heisman being, after all, the most beloved individual award in American athletics – not just college football – today. [The Heisman Trophy] is not my best work but it turned out to be something like the Statue of Liberty. I always thought it was wonderful that I’ll be able to leave something like this behind. That said, I am not someone who cares about the Heisman, at least not enough to post on the trophy’s importance to the American culture. Although I have known for awhile that in 1935 Jay Berwanger from the University of Chicago was the first recipient of the prize, it was just recently, while watching the bowl game between the Gators and the Sooners, that I learned of the 2007 winner, Philippine-born Tim Tebow. This is how indifferent I am to the Heisman and everything related to the Heisman. hahahah…… my funny video of me doin the heisman on dem hoes!!!! I discovered this gem through the usual route of Internet queries and result-clicks. In other words, I have no idea how, it was simply where the machine wanted to take me based on its algorithmic interpretation of my intent. In this way, I stumbled upon Michael doing a dance that incorporated a slide show of Heisman poses, and somehow I laughed. Am I ashamed to admit it? Not really, I am more ashamed to admit that I had never heard of 3rd Flo and their hit single, Do the Heizman. At first glance, it seems as though this crass phrase has a unanimous meaning that has no association with the Heisman trophy or its history other than the Ed Smith pose that is part of the song. I had to dig further to come to a full appreciation of the lyrics and the culture surrounding this brand of hip-hop, which Chicago-born Soulja Boy Tell ‘Em pioneered with his self-published hit-single Crank That, a song that first appeared on the Internet in 2007 and then climbed to the top of Billboard Hot 100. It is no coincidence that the dance associated with Crank That played a major part in pushing it to the top of the charts, where it stayed for seven weeks. In comes 3rd Flo with a comparable hit song in that it also carried the same xylophone melody and, more importantly, a catchy dance. But what does doing the heisman on that ho mean? I just found out yesterday that to “do da heisman on dat ho” apparently means to “diss an ugly chick” and comes complete with crazy dance moves. I guess this has awhile before it makes its way to the big HK. Now we’re getting somewhere. To diss an ugly chick, huh? The beginning of 3rd Flo’s song is: Shawty fine, breff stank (Do the heizman on dat ho)/Tryna holla, no bank (Do the heizman on dat ho)/Breff stank, no bank (Do the heizman on dat ho) (Do the heizman on dat ho) (Do the heizman on dat ho). 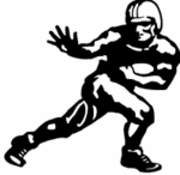 Basically, to do a “Heisman on dat hoe” is to push some unattractive or undesirable women, in the case of a hoe, away from you; this term comes from the Heisman football trophy, which displays a football player in an athletic stance extending one arm out with and open hand. So as “dem heizman boiz” say “breath stank, no bank” do the heisman on dat hoe, they are literally pushing her away because she smells and is broke. I suggest finding an image of the Heisman trophy; the thought of this song while looking at it is pretty funny.